In this guide we’ll take a look at the best soil testing kits for the UK market. I’ve compared pH accuracy, features, ease of use and cost to give you my top recommendations. What Is The Best Soil Testing Kit? This great little soil testing kit from MoonCity is exactly what you need for fast, accurate readings. Even if you’re just interested in your soil’s ph, there’s no harm in knowing the moisture and light levels too. Ultimately, it’s all valuable information to help you create the optimum environment for your plants. Importantly, it’s very easy to use. It’s simply a case of sinking your kit into the soil, then pushing the switch to the left, centre, and right to get accurate readings of the moisture, light, and pH. Finally, it’s also well-priced compared to some other soil testing kits, making this MoonCity 3-in-1 Soil Tester our top choice. It’s the best soil test kit for the money. This 4-in-1 Soil Test Kit is really useful for those looking for digital accuracy out in the garden. Able to measure not only soil pH, but moisture, light and temperature levels too, it really is an all-encompassing reader. The only reason why this soil testing kit comes as a close second on our guide (despite having more features) is purely because some users have reported it can be a little complex to set up. I suppose any digital reader is going to need some configuration, but for those simply looking for an ‘out of the box’ solution, you’re perhaps better off with the MoonCity 3-in-1 Soil Tester which is probably a bit easier to use. This Luster Leaf pH Soil Tester is probably the quickest, easiest, and cheapest soil test kit on the market. If you’re purely interested in the pH, and not fussed about moisture, light and temperature readings too, this simple kit is the way to go. It comes with a handy colour chart to measure your readings, which although doesn’t have the accuracy of our better recommended models, is perfectly fine for your weekend gardening who just needs to know which plant to bed where. For the money it’s the most economical soil testing kit available. If your soil testing needs go beyond a few simple readings, and perhaps the quality of your crop is linked to your commercial success, then this professional soil testing kit is certainly worth your consideration. Not only can this Professional Soil Testing Kit test for pH, but it also goes as far as testing for important nutrients in your soil such as Nitrogen, Phosphorus and Potash – which of course play a crucial role in the health of your yield. Capable of performing 350 tests, but compact enough to fit inside a tidy carry-case, this soil testing kit is suitable for those wanting more scientific insight on their soil composition. The Gardener’s Mate Soil Testing Kit is another good option for your those looking for basic insight on their soil. Although it doesn’t have the features of other kits on our list, it’s a perfectly good indicator for those who just want to know whether their soil is acid or alkaline. Readings are taken using a handy colour chart, but isn’t as quick as other kits. Acid, alkaline or neutral soil: does it actually matter? An overly acidic or alkaline soil pH can mean your garden doesn’t have enough of the nutrients your plants require. Is this a problem? It depends on your gardening personality. Type 2 – buys plants they love and hopes for the best. They think plants have managed for thousands of years without interference so they can take their chances now. They like daisies in the lawn. When asked what type of soil they have reply with ‘Brown’. Obviously soil pH is going to matter more to a type 1 gardener than a type 2. But no matter what camp you sit in, you have to know your soil first. Soil pH describes the acidic or alkaline nature of your soil. This indicates what kind of nutrients your soil is likely to hold. Nutrients like iron, magnesium, calcium and potassium are important for healthy plant growth. If you want healthy plants it pays to know your pH. A pH of 7 means your soil is neutral. At this point soil nutrients are at their best. Anything above 7.0 is alkaline (think chalky) anything lower than 7.0 is acidic. A pH above 7.0 means the soil is alkaline. At this point phosphorous, iron and manganese levels are lowered. This can lead to poor plant growth, but on the plus side it reduces club-root disease in brassicas (greenery such as cabbage). There’s always a bright side. Alkaline is the most difficult type of soil to change, so you’re best off choosing plants that like alkaline soil. If you desperately want to the change your alkaline soil conditions then you’re in for a struggle with Mother Nature. Use acidifying sulphur agents or buy pine needle compost. Keep digging it in and mulch thickly with ‘organic matter’ (that’s horse/ chicken /farmyard poo to most of us). You’ll need to make these improvements every year because the soil will revert back to its comfort zone. A pH below 7.0 points to acid soil. That sounds bad but it’s actually beneficial in small amounts. It depends how acidic it is. A pH of 3 – 5 is very acidic. There’s going to be a lack of copper, calcium and magnesium plus bacteria can’t rot down plants and organic matter when the pH is below 4.7, so no goodness gets into the soil. Nutrients are used up quickly with no replenishment. It’s a bit like the Ferrero Rocher crisis at Christmas. Or perhaps you’ve got an acid pH of 5 – 6. That’s not so bad. You’ll be a master of rhododendrons who love acid conditions. You’ll still have some of the issues above but not to such an extent. A pH of 6 – 7 is the least acidic and good for growing. Just about everything will thrive in this soil because the nutrients are plentiful. It’s Club Tropicana for worms. If your soil is very acidic you can dig in lime. This will help balance out your pH, but you’ll have to keep doing it each year. A pH of 7.0 is considered neutral. Plant whatever you like. A mophead or lacecap hydrangea, but not a white one. Scoop up a good handful of soil from the growing areas of your garden. Separate this into two cups. Add vinegar to one cup of soil. If it fizzes it’s alkaline. Add some water to your other cup of soil so it’s tacky and muddy but not drowned. Add half a cup of baking soda. If it fizzes your soil is acidic. No reaction means you’ve got a pH of 6.5 -7.00 and the best type of soil. Hydrangeas are lovely plants. Mophead and lacecap varieties flower all summer and look stunning. 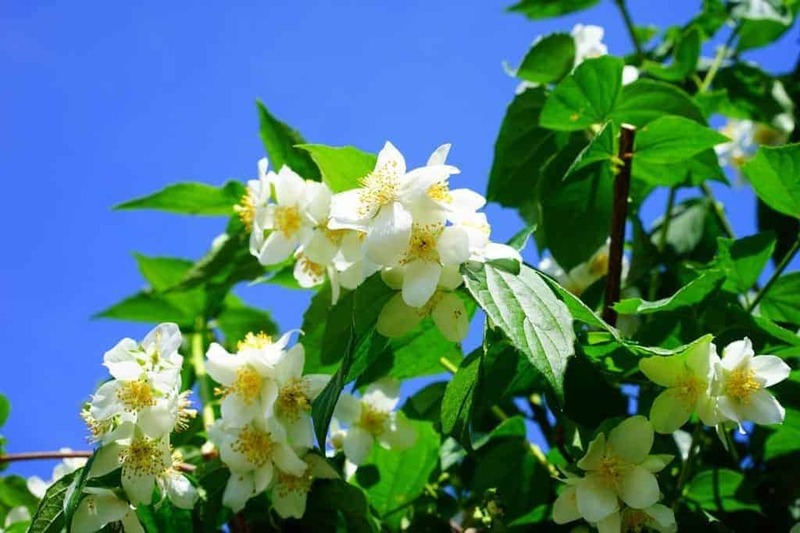 Most varieties will bloom blue in acidic soil and bloom pink in alkaline but a white variety will stay white. 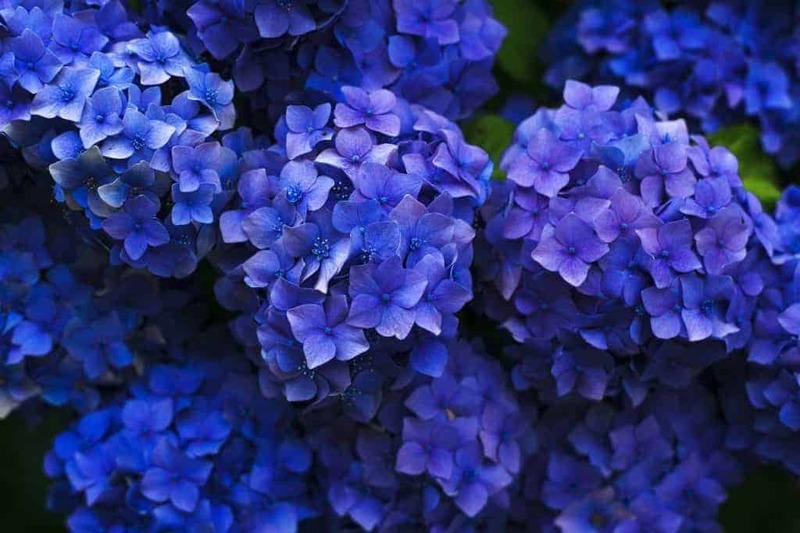 If you desperately want the blue type then grow your hydrangea in ericaceous compost. This is easily found online or in garden centres. You should also water it with rain because hard tap water can turn blue flowers pink! Perhaps the cheapest way to identify your soil pH is by taking a look in your neighbour’s garden. Marvellous camellias and rhododendrons in the ground mean soil is acidic. Stunning clematis, cherry and yew means it’s likely to be alkaline. Neutral, mildly acid or mildly alkaline soil isn’t going to make much of a difference to your planting strategy, but if your soil is leaning very strongly in one pH direction you’ll save money and time buying a plant to suit it. If you have a strong pH, sometimes you can grow many ‘unsuitable’ plants by filling the planting hole with compost and mulching regularly as this maintains a more neutral growing condition. I do this with camellias on my alkaline soil and they’re doing just fine. If you’d rather not fight nature here’s a rundown of some easy to grow plants that like a strong pH. Beans, blueberries, magnolias, Japanese anemone, rhododendron, summer heather, pieris, camellia, acers, azaleas, berberis and begonia. Alpine pinks, delphiniums, baby’s breath, carnations, ferns, lilacs, mock orange and spiraea. If you currently have plants that just aren’t thriving even with enough water, light and food (be honest now, are you looking after them properly?) then the soil may be to blame. If you have an acid-loving plant listed above with yellowing leaves and stunted growth you probably have alkaline soil. Dig them out and house them in a container of compost. If they improve, then you know the answer. You can’t go wrong by digging manure or compost into your soil, no matter what its pH. Organic matter replenishes spent soil. You can’t expect nutrients to last forever, especially the way we rake up leaves and remove all the food plants have made for themselves. Try digging your leaf fall into the earth, if you don’t have leaf fall, invest in some compost and you’ll see you plants improve no matter if it’s acidic or alkaline soil they’re in. It’s worth being aware of your soil pH because it can help your plants to thrive. You only need to do this once and then simply choose suitable plants. This will cut down on work, save you money, brighten your outside space and make all the difference to your garden.